On the subway platform at Union Square, we came across a vendor with this colorful badge board. Groucho Marxist, Straight But Not Narrow, Born This Way, Whatever! Barack Obama, Martin Luther King, Haile Selassie. 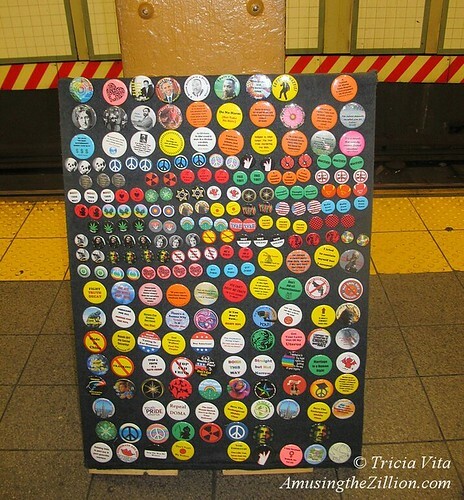 The badge board man –as his profession used to be called–said he began selling the buttons in Union Square after losing his job. The chance encounter brought back memories of my father, who liked to say that he was a jack of all trades and a master of none. 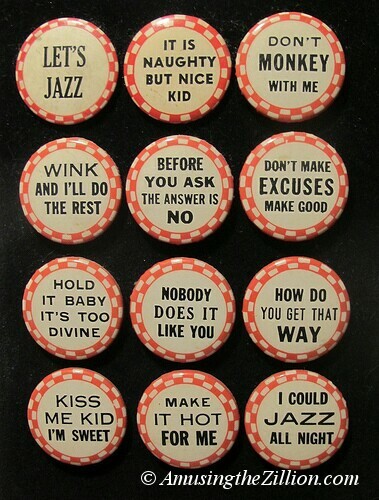 Before he got into the carnival business, one of his trades was selling buttons with funny sayings and novelties at fairs and parades. This miniature black velvet badge board was created with some old buttons that turned up after he died. Let’s Jazz, How Do You Get That Way, Don’t Monkey With Me, Kiss Me Kid I’m Sweet.